EVERQUICK is a 22/43 kW fast AC recharger for electric vehicles, which complies with the IEC 61851-22 charging protocol. 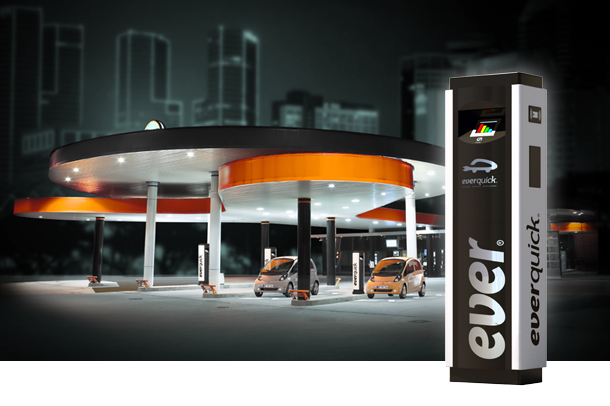 EVERQUICK is an ideal solution for vehicle users, electrical utilities and future petrol stations when a fast charging is required, because it offers much shorter charging times than other solutions. EVERQUICK provides 400V AC with a type 2 connector (Mennekes) according with standard 62196. It’s also possible to be supplied with a connector type 1 (SAE J1772) or type 3 (Scame). EVERQUICK has one industrial embedded PC and a user interface with a 5.7’’ colour touch-screen that makes the charging procedure very easy and intuitive, showing all the required information during the charging process. EVERQUICK is equipped with a contact-less user identification system (RFID), allowing proper validation, billing procedures and statistical use reports. Optionally, EVERQUICK has the capability to send SMS messages, informing the user when the charging process has finished, and including a brief report of the recharge data. · Integration of an EVERQUICK equipment in an EVER network.